If you are thinking of moving to Hawaii, you will have many questions and want to have them answered before your move to Hawaii. Once you have looked around the islands and seen them for your self, you will have a better idea which island you would feel most comfortable on. Life on the various islands are different, as well as the cost of living, salaries and job opportunities. On Oahu, you should know that this is the busiest island. It is a good idea to find a vacation rental before you arrive because then you will have more time to start exploring the island right away. A good time to come here is between Feb. and May and between Sept. and Nov. During these months, less tourists come to the islands; therefore, flights, auto rentals and short-term rentals are easier to find. Kauai, Maui and the Big Island are less populated islands and living on these would make you feel like paradise, compared to busy cities. 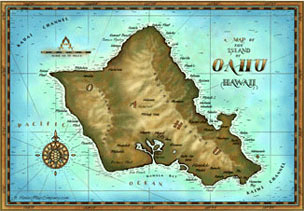 Shipping a car from the mainland to the Hawaii can be arranged by Matson Navigation. The cost is around $900 per standard vehicle. visit Matson Navigation’s website at http://www.matson.com. Hawaii is very strict for importing pets. For more information, please visit http://www.hawaiiag.org/hdoa. The most expensive area on Oahu is in Waikiki, where a one-bedroom apartment costs approximately $1,700 per month. You should know that the cost of housing goes up every year. Rentals in Hawaii is more expensive than on the mainland. As of 2008, a studio on Oahu costs anywhere from $800-$1,500 per month, depending on the location. A two-bedroom apartment or a house starts from $1,600 per month and up. Make sure you bring all your documents with you, ID, personal papers, medical records, prescriptions, etc. Keep these documents at safe place in your carry-on luggage. We recommend to bring as little as possible. Here on the islands you can find a furnished apartment with all the items for living. Therefore, it won’t be necessary to bring pots, silverware, furniture, etc. Bring your personal items and clothes. If you need more clothes you can find clothing stores on the islands. The average cost for a breakfast is from about $5 to $8, for lunch from about $6 to $11 and for dinner about $12 to $35 and more. The cost of buying a home or condo in Hawaii is also above the national average. To research the latest property prices, search the complete Hawaii MLS. Although about 91 percent of the food in Hawaii is imported, you can buy food at low prices at chains on the Islands like Costco and Walmart. Some supermarkets also have sales. Waikiki has nightclubs, restaurants, shows, bars and much more. A disadvantage of living in Waikiki is that there is only one grocery store, which is also very expensive. Waikiki is famous among the tourists and there are many hotels. If you choose to live in Waikiki, you will be very close to Waikiki Beach and Diamond Head. If you are into nightlife, Waikiki is a great place for you. Oahu is the only Hawaiian Island where public transportation is available. It is called The Bus. For more information about the cost of a ticket, routes and schedules, visit www.thebus.org. don’t provide public transportation services. Rush hour is early in the morning between 6:30 and 8 a.m. and in the afternoon between 4 and 5:30 p.m.
Traffic is a real problem on the island of Oahu. Taxi services are available on all islands. Parking is one of the main transportation issues on the island of Oahu.